How can you tell whether attending an arts high school is a good fit for you, your child, or your student? What can be gained from attending an arts school that would otherwise not be available? And how does it impact your acceptance to college? Arts high school administrators and college music school admission directors offer insights and wisdom to assist you in thinking about what makes sense. Arts-focused high schools inspire an environment of creativity. According to Jamie Knight, Music, Media & Entertainment Technology department chair at Huntington Beach High School’s Academy for the Performing Arts, creativity is the #1 skill required in the 21st century. Donn Harris, executive and artistic director of Oakland School for the Arts, agrees. “Regardless of whether you go on in music, creativity is important in whatever you do, even in areas like medicine and politics,” he says. “Attending a performing arts high school is a great way to discover what it’s like to study music in college, and/or professionally. It is helpful to think of the experience as job training, learning the ways of the performing arts culture and history in a safe environment,” offers Paris Brown, former director of Lawrence University Conservatory admissions. She sees a number of Lawrence applicants come through arts high schools. As a freshman, Bryan Dunnewald attended a conventional high school in his hometown in Colorado. After spending the summer at Interlochen Summer Arts Camp, he transferred to Interlochen Arts Academy High School to continue to pursue his passion for studying organ, and never looked back. “Studying at an arts school gave me the opportunity to study and live amongst other talented students. While great teachers exist all around the world, studying at Interlochen allowed me to learn from the teacher and students. This sharing of artistic ideas and knowledge — the environment in which I lived — is what makes studying at an arts school unique. “This served me in a number of ways. I was able to learn about other instruments and fields from those who know them best, and apply that to my own musicianship. I was able to have close contact with brilliant teachers who helped me grow faster. I could take part in a larger creative process. And I collaborated with writers, composers, ensembles, and dancers, to name a few. We created new works and shared them with others to inspire them. They, in turn, worked together to inspire us.” Brian went on to Curtis Institute of Music for his Bachelor of Music degree in Organ Performance, and continues to compose, perform, and teach. 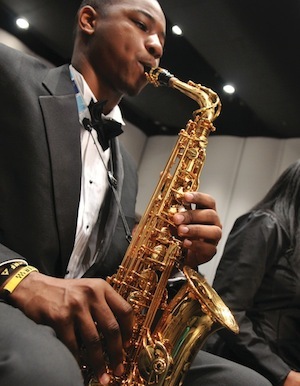 Does attending an arts high school give you a leg up when it comes to getting into college for music? 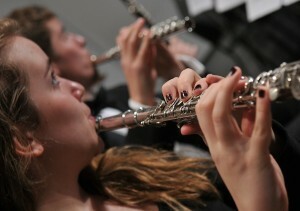 Most arts high schools incorporate a strong music theory and music history component into the curriculum. Donn Harris at Oakland School for the Arts says this training can be difficult to come by in conventional high schools. His school is prepared to take students all the way to the college level in music theory. Why is this helpful? It allows students to approach college music theory with confidence instead of dread. Many test out of introductory-level college music theory classes. This makes room for more electives, and lessens the burden on students who want to be dual majors or add in a minor. Kara Golden, associate director of admissions, Mason Gross School of the Arts at Rutgers University, points out that “Although going to a particular high school may prepare an applicant well for an audition, the high school name by no means makes a difference in admissions.” Gaye Matravers, senior associate director of Admissions & Financial Aid at Indiana University Jacobs School of Music, agrees. She says that students need a strong, robust program to participate in at their high schools, recognizing that they can find this at a conventional high school. What’s even more essential are lessons from a highly proficient private teacher. Arts high schools are demanding. They require more practicing than students are used to. They also require students to successfully navigate a rigorous college preparatory curriculum. They are a good fit for “serious music students” who are “hard and dedicated workers,” says oboist Ryan Zwahlen, chamber musician and former chair of the Music Department at Idyllwild Arts Academy. Rick Shaw, assistant principal of Denver School of the Arts, says that students who can multi-task and communicate with confidence will fit in well at an arts school like his. In addition, they must be passionate and committed to their art form and willing to be risk-takers. For students not ready to tackle the demands of an arts school, a conventional high school with a strong performing arts component is an option. Private boarding schools are another option for students not quite ready to commit to the demands of an arts school directly after middle school. These schools will all work with older students who are interested and ready to consider transferring. What if you change your mind about pursuing music? Arts school administrators recognize that not all of their students will go on to major in music or any of the arts. Still, they believe and can document why attending an arts school is invaluable. Jamie Knight at Huntington Beach Academy for the Performing Arts adds that regardless of whether a student goes on to study and have a career in the arts, they will always be an arts consumer and possibly an arts “hobbyist” as a result of immersing themselves in a creative arts environment in high school. Arts high schools include a strong academic component in conjunction with intensive arts study. However, some college-level music schools find that not all arts high school graduates are as academically prepared as they need to be. Gaye Matravers at Indiana University urges high school students to make sure they don’t let the academic aspect slide. She encourages them to start thinking early on about where they may want to apply to college and about what they may want to study. This should help them with college acceptances and with meeting the academic demands of college. Arts schools vary greatly in cost. Many are public charter schools connected to a school district; some are independent public charters. While there are no up-front costs at such schools, families are likely to be asked to donate some amount of money to help offset the myriad costs of running the school. They are also likely to be asked for donations of time. In fact, most arts schools depend on a strong parent volunteer base for support. It’s important to note that arts schools typically have dedicated college counselors available to help students figure out where to apply and how to get scholarships to offset the cost of college. When you go to an arts school, all the other folks like you come from around the world to study there. They’re probably just as good, if not better, than you. Do not be alarmed and do not stop working because you think “I’ll never be that good!” This is why arts schools are great. Take the opportunity to learn from each other. That coupled with hard work means you’ll get better and better. It takes bravery, work ethic, and determination, but if you can do it, chances are you have the determination to “make it,” whatever that means for you. When you make a decision to study music, it’s a commitment. Accountability is important. Be ready to be committed and to work hard. Don’t be afraid to put yourself out in front of others. Learning to master an instrument takes time and discipline. Practicing needs to be at a consistent level over a long duration of time. It will not happen over night (for most of us anyway), so stay diligent and patient with things. Be prepared to work on a higher level both in quality and intensity of artistic effort. Get private instruction on your instrument or voice. No amount of group training at school can match individual one-to-one instruction with a really good teacher. Seek out the best private teacher in your area and get to work. Don’t expect that your teacher will be able to give you all the magic answers. I believe there is an element of self-discovery in learning your instrument/voice. You have to spend time experimenting with things and find what works best for you. Hopefully your teacher can guide you through this discovery and you’ll find success at the end! Accept disappointments and look at them as opportunities. Understand that criticism may sometimes come in a very direct and less than compassionate manner. Know that every day is an audition. Lots of auditioning (typical in an arts high school) offers the chance to learn how to handle rejection really well. This will serve you if you plan to move on with a career in the arts. Regardless of whether or not you will major in music, attending a performing arts high school can teach you how to incorporate performing in your life and how to build lifelong friendships and memories along the way. Successful boarding school students have a couple of things in common. Most importantly, an arts boarding high school experience is about being challenged. So it is an ideal experience for students who are looking for something that they can’t find in the public or day school setting. Boarding school is an immersive experience that creates academic and artistic opportunities that just can’t be squeezed into a normal school day. Secondly, boarding school requires a level of independence and maturity beyond what is required for students who live at home. While boarding schools such as Interlochen provide excellent resources to help students make the adjustment, in order to thrive students need to bring maturity and motivation. ASN member schools include arts-related public, private, and boarding middle and high schools as well conventional schools with strong arts programs. According ASN Executive Director Kristy Callaway, no two schools are alike. Finding a school that offers the program and the teacher you want to study with is really what makes all the difference. ASN shares effective teaching and instructional methods with member schools, provides talent scholarships for students, and holds summits and an annual conference to support its members. Advice for evaluating independent private schools. Public arts magnet school in Dallas, Texas. Public arts middle/high magnet school of the Denver Public Schools. Public magnet program of the Huntington Beach Union High School District in Southern California. Accepts students who attend any of the high schools in the district. Private boarding arts high school in Idyllwild, California. Private boarding arts high school in Interlochen, Michigan. Public charter high school for the arts serving a 12-county region and located in Bethlehem, Pennsylvania. Public middle/high charter school in the Oakland, California Unified School District. Public residential high school for artistically-talented students from South Carolina and located in Greenville, SC. 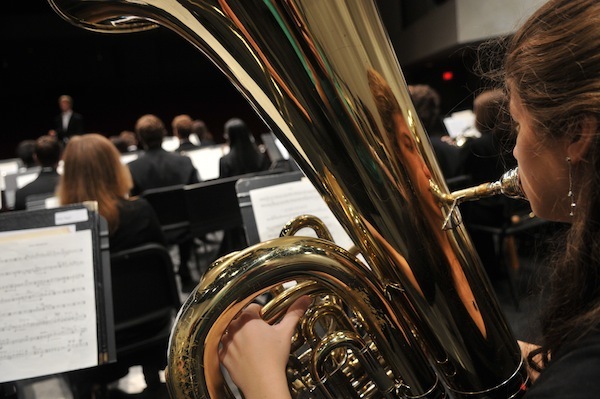 Most music students apply in 10th grade to attend in 11th and 12th grades. Private boarding arts high school in Natick, Massachusetts. * Note that acceptance to these schools is audition-based.